Atlantic ocean and Marina views apartament in private condominium. Short walk to the beach, Marina and Albufeira strip with restaurants,bars,shops. 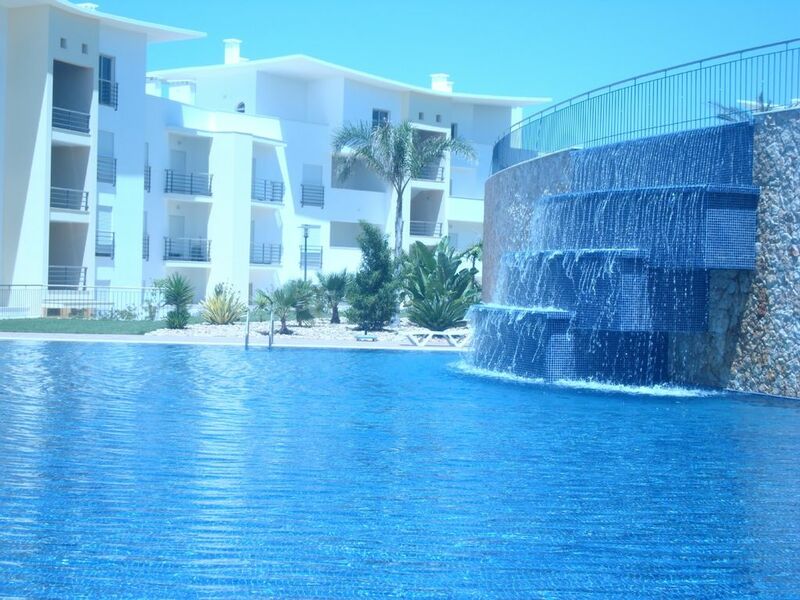 The complex is situated between central Albufeira and Marina,restaurants, bars, shops and supermarkets are within a short distance. I recommend car hire or airport transfer. There are several golf courses just 15 minutes to drive Salgados, Pine Cliffs, Balaia. Everything you need for a great holiday. We stayed for 5 weeks and it really was home from home. Well appointed kitchen and comfortable lounge and dining area. Most of all we liked the balcony for the glorious sunsets. Great location, clean apartment and brilliant space. Only a 10 minute walk down to the old town where there is an abundance of great restaurants and bars. The only thing I would advise is to buy a parasol for the pool as the apartment doesn't have one and neither does the pool. The apartment was very nice and comfortable. The apartment was very nice and comfortable, and the view is fantastic. I was disappointed with the amount of graffiti in the town and on the beach cliff faces though. It's a shame because the city has so much potential and charm. We stayed here in early September, the apartment was clean and well equipped, We were met at the apartment and given directions on all facilities. The balcony got the sun from mid afternoon until the sunset and was lovely at the end of the day to enjoy a glass of wine. The complex and pool area was extremely well kept and there were ample sunbeds. We hired a car from the airport and there was safe garageing. The walk into Old Town Albuferia is all downhill, but the return journey can be a struggle, I would recommend a car for convenience. We ate out in the evenings and both restaurants at Gale beach were excellent, we would also recommend Pinchitos, just past the Marina and Dom Dinz on the main road between Sao Rafeal and Gale. My fiancé and I have just returned from a week staying at this apartment. It's lovely, great location away from the main strip but easy to walk to in about 10 minutes. Great views from the balcony, most mod cons provided, could not fault it! Gorgeous Views and a luxurious apartment! We have just come back from a 9 day stay in this 1 bedroomed apartment. The kids stayed on sofa beds in the living room. There's sky TV in the living room and a dining table! Very tastefully decorated and modern. Gorgeous floor tiles! The bathroom has a jacuzzi! Kitchen is fully fitted with a integrated washing machine and dishwasher! Air Con in the living room and bedroom! The views are absolutely stunning!! And there was a lovely cool breeze from the sea which blew through the apartment! There is underground parking and the complex is very safe and difficult to get into without a key! There is a communal pool and a huge kids pool! The water is salted so does not contain any harmful chemicals! Great for skin and hair! Loved it here and would definately go back! The lady we rented from is very plesant and came out late to meet us with the keys! First ( 100 euros )payment not refundable.